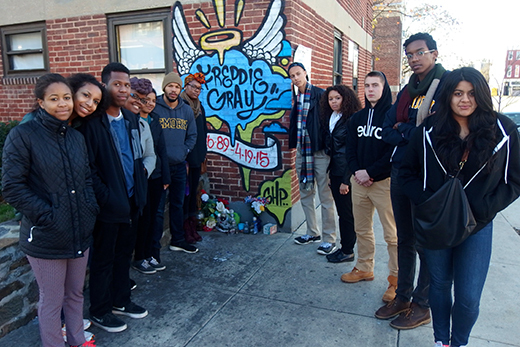 Students in African American Studies 100 traveled to Baltimore this month to understand the context of the protests that followed Freddie Gray's death in police custody and present their research to community organizations. They are shown here at the site of Gray's arrest. It's one thing to scroll through scholarly articles about the death of Freddie Gray, whose fatal encounter with Baltimore police officers while in custody in April heightened national dialogue over race and injustice. But to take those lessons to the streets of Baltimore — to walk through the Sandtown-Winchester neighborhood where Gray lived, to see hand-painted tributes that have sprung up in the wake of his death, to talk to a neighbor who remains haunted by the cries for help he heard the morning of Gray's arrest — is an entirely different experience altogether. That's what Emory professor Lawrence Jackson was counting on when he arranged for a dozen students in his African American Studies 100 course to spend four days in Baltimore earlier this month — a rich, real-world experience that would invite students deep into the realm of hands-on research. Not only did the experience offer lessons far beyond a textbook, it also matched students with on-the-ground organizations to examine urban community problems and present research that could help shape solutions. "Reading about this case in the papers and watching it on the news, you don't get to experience the neighborhood, to talk to the people who live there," says Jackson, Winship Distinguished Research Professor in the departments of African American Studies and English. "The main thing I hoped to drive home for students were the advantages they have in studying at a research university, and one way to do that was to try to get them in contact with communities that do not have those resources," says Jackson, a Baltimore native who grew up about 2.5 miles from Gray's neighborhood. So Jackson devised "Baltimore Up Rising," a thematic focus that divided students into four research groups: educational inequality, housing segregation, mass incarceration, and health care disparities. The goal: Foster a better understanding of the causes of urban poverty, racial discrimination, and the factors that fed public protests and unrest that exploded in Baltimore in response to Gray's death. However, Jackson sought to take the experience a step further, providing students a chance to visit Baltimore and present their research to community groups that could actually use it in their work. With a Fund for Innovative Teaching grant from the Center for Faculty Development and Excellence, financial support through Emory's Department of African American Studies, and some of his own research funds as a Winship Research Professor, Jackson was able to underwrite a class trip to Baltimore, which ran Dec. 3-6. "My hope is that there would be some real learning on the ground, talking about things that we deal with in the classroom and put real people and places behind those extractions, and to value the community commitment that is required for this work," he explains. Student groups began their projects in the classroom, reviewing literature and developing research portfolios in conjunction with grassroots organizations in Baltimore who were trying to "change things on the ground, but needed the help of a research team," Jackson says. "That's something that we do fantastically well here at this university," he adds. "Everybody is immersed in research. It might be the strongest thing we offer our undergraduates." Teams created annotated bibliographies, websites and newsletters; wrote op-eds; developed brochures to use in lobbying efforts and templates for newsletters; and researched grant opportunities. The class also held two joint public forums with students from Atlanta's Morehouse College. For 18-year-old Morgan Mitchell, the chance to engage with the issues in a meaningful way was an experience far beyond what she could have dreamed of during her first semester of college. "Once we got to Baltimore, what was written in books became glaringly apparent," she says. "News coverage had often focused on the spectacle of riots, tear gas and lootings. We saw how those things spawned from levels of poverty and racial disparity." "I came away from this experience with a better understanding of how things such as mass incarceration, housing and health care are all interconnected — and the main glue holding them together is poverty, discrimination and racism," says Mitchell, whose student team helped research grants to build a new community center. Jackson was pleased to see the Emory students, primarily freshmen and sophomores, "invest deeply and with a new level of sincerity, expertise and professionalism" with an "adamant determination to get to the bottom of the causes of the phenomenon that they had taken on." And there were lessons for the professor, too. "It was unsettling to see, once again, that so many of the problems there have been so consistent over such a long period of time," Jackson says. "That was a difficult reality for me," he adds. "The problems that we were dealing with in the 1980s and 1990s are almost exactly the same."